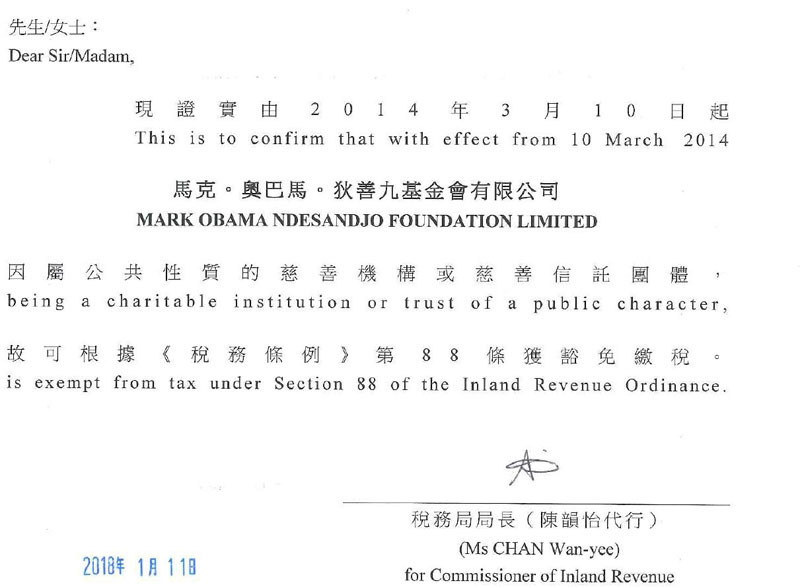 The Hong Kong government has approved the Mark Obama Ndesandjo Foundation Limited as a charity with tax exempt status effectively from March 2014. This Section 88 certification allows donors to claim tax exemptions, and enables the foundation to use more of its funds for needy causes . The board of directors, in particular David Buxbaum of the esteemed law firm of Anderson and Anderson, as well as Professor Alice Chiu were instrumental in making this a reality. “Now we can direct more of our donors funds to our mission, and allow donors to give their funds to needy children instead of to the government,’ said Mark Obama Ndesandjo.